SPOILER ALERT: If you have not done the Point of No Return living story yet, DO NOT READ! In my previous post, I said the season had to end on a high note or a cliffhanger to keep players interested for next season. Well ArenaNet, you one up-ed my expectations. First part of the episode is a GW1 throwback as we go through a shorten “path to ascension”. We had to do this in order to obtain a divine flame used to open the cave we found in the previous episode which was pretty cool. I really like how ArenaNet take the time to incorporate some GW1 nostalgia for the veteran players. The challenges we have to do are pretty much similar to the ones in GW1. Next part of the story is that we had to fight off Mordrem that invaded the Silverwastes camp. Needless to say, we fend them off, but what’s important is that Trahearne decides it’s time to fight Mordremoth but you have to go find Glint’s egg so you don’t join the assault. Also important to note that Logan, Eir and Zojja go with Trahearne in the assualt. Now for the main part. We find out the dark truth from the last part of Caithe’s memory where Wynne tells Caithe when they’re alone that Sylvari are from the Elder Dragon Mordremoth and are meant to serve it. Now, during this little talk, Faolain was off to the side finding some thorns to torture Wynne with in order to spill the beans. As much as Caithe loves Faolain, she knew deep down what Faolain was capable was with this information and killed Wynne at her request. This is all valuable information but it didn’t really hit me because I had a plant dragon to fight shortly afterwards. So after the fight is over, I see “Episode Complete”. I’m thinking to myself “well, finding out Sylvari are born from the Jungle Dragon is important but not much of a cliffhanger”. Then I hit accept from my rewards. Then the cutscene started. I should have known that was coming. Like pretty much everyone else, my mind was blown. The Heart of Thorns trailer was incredible. We’re going to have a massive problem with the Sylvari. 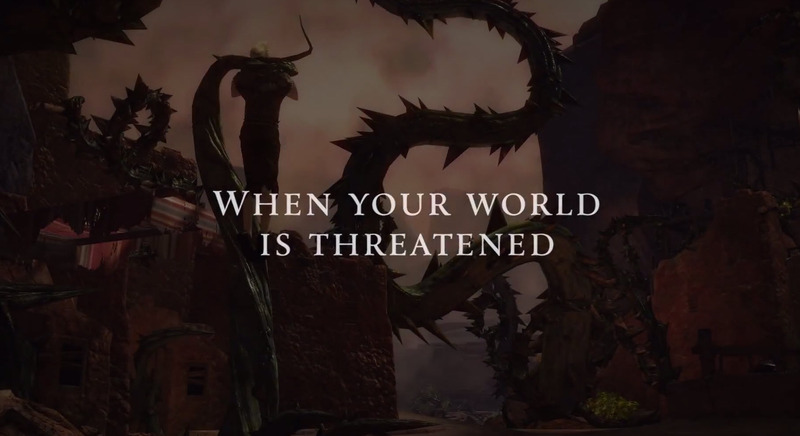 The way the trailer put it, it seemed like a Sylvari extermination will take place. 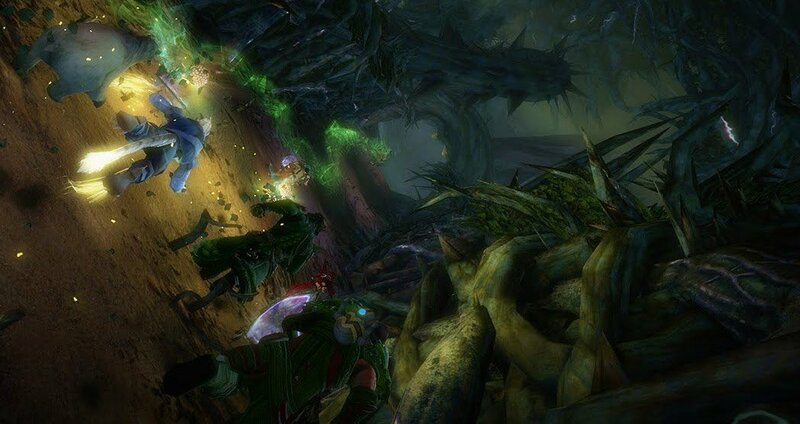 And that would gave the Nightmare Court every excuse to fight back in order to exterminate all non-Sylvari. This is all, of course, will lead to some bad results unless Mordremoth is dealt with. I did a breakdown of the entire trailer here. Needless to say, I can’t wait to hear what Heart of Thorns is all about! This is it. The point of no return. I’m going to keep it kind of brief but man I’m glad there’s a new living story patch to get me back into the Silverwastes. The beginning of the trailer eludes to the war machines being build in the camp will be finally used to make an assault. We’ll also be finding out the last bit of Caithe’s past on what happened 20 years or so back. Wynne was there with Caithe so my assumption is that Wynne showed Caithe this “power” that shouldn’t be used which would be linked to Glint’s egg somehow. There’s that dragon which looks similar to that in the starting point for Sylvari but not enough to warrant something big in my opinion. This patch I think will feel like the Tangled Paths instances with the Caithe feature from Seeds of Truth. I fear that the season is being cut a little short but that may be due to ArenaNet being at PAX South and having an announcement of new content there. A new living story patch could kind of overlap what they want to prep and show at PAX. What I think Point of No Return needs is a big cliffhanger. And I men a BIG one that will make me go “awwww… wait… what?!”. Something that will make players go “I need to play next season”. Rytlock could be that cliffhanger but since we know he has new armor etc, we need something that’s not known. We’ll just have to see what next week brings! Alright so The Seeds of Truth patch wasn’t as contented filled as I thought it would be story wise. However, it does bring up some interesting exploration aspects to Silverwastes and some legit hard content. Note that if you haven’t played this episode yet, you should come back after you’ve done it. The story is all about why Caithe took away Glint’s egg. To do so, we attempt to relive some of Caithe’s past memories around 20 years ago. We were put into 2 instances and both were pretty bleak moments. The first was when some of the 2nd born Sylvari that recently came into the world were kidnapped by Asurans and subjected to cruel experiments. Caithe and Faolain wanted to put a stop to it; however Faolain wanted to take it another step further and eradicate them. You can see Faolain’s tolerance against races other than Sylvari come out in the 2nd memory where Caithe and Faolain track down their firstborn counterpart Wynne. Wynne made friends with the centaurs but Faolain instigated a fight with one of them which lead to Caithe, Faolain and Faolain’s “friends” killing the entire herd. Now what could be overlooked is the main reason why Wynne is important. Wynne found out something powerful and told the Mother about it. Faolain overheard this and thought Wynne and the Mother were keeping this power to themselves. Hence the trek into the Silverwastes. 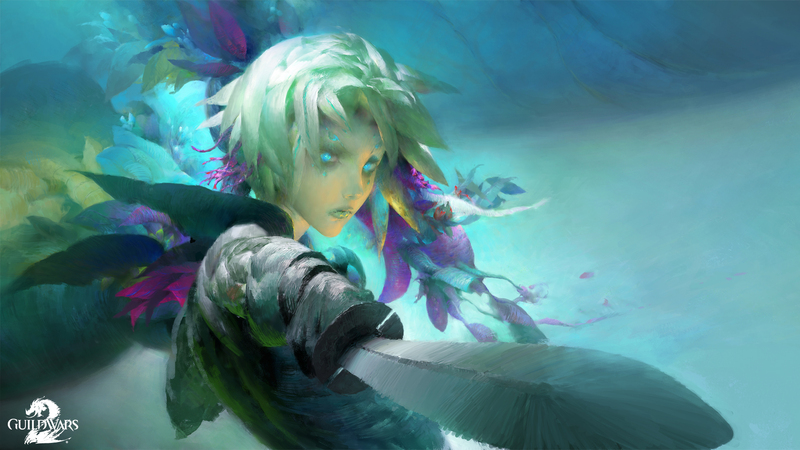 This “power” by the way the Mother phrase it as it could “change Sylvari” is likely related Mordremoth. What would be interesting is the likely corruption affecting Faolain and other Sylvari. What I really want to know is what’s behind those doors. Is it a gate to somewhere? Is it a ruin with this great power inside? So much to know which will be great to find out in the next episode. But we may have to wait because Wintersday is coming up. For the exploration part, there’s a huge underground of the Silverwastes to discover and a jumping puzzle that took me an hour and a half to figure out. It took 10 – 15 minutes the 2nd time. There are two pieces of armor to get so it’s a bit longer to gather bandit crests for the other pieces you don’t get for free. Some of the new gold badges to collect are in really odd places where you can fall to your death with a bad jump. That’s about it for Seeds of Truth patch. I’m very interested in what’s in those ruins and the history between Caithe and Faolain. So, if I’m not horribly mistaken, Faolain is in this trailer. Of all people Faolain would be one of the last I’d expect Caithe to team up with… unless the next episode is a flashback episode?! So let’s break a few parts down. The reason this could most likely be a flashback episode is the line “Sometimes, to catch a thief you must become a thief”. During that line you see the part where Caithe comes in the steal the egg but then there was a teleport-like sound and we see a Sylvari (which I assume is a player character) turn into Caithe in different clothing. That scene and that line also makes me think we’ll be playing as Caithe for part of the story which would be awesome! Also, there was a scene with Faolain in the Grove. There’s no way Faolain would be in plain sight in the Grove as part of the Nightmare Court unless it was a time before it was formed. Faolain seems to have another Sylvari with her. Maybe she’s Faolain’s apprentice, maybe someone more. At one point, Faolain is standing beside Caithe near an Asuran who doesn’t look like an Inquest member but there are instances in the trailer where Sylvari are being experimented on by Inquest. I think it’s the lab in Brisband Wildlands. Makes me wonder if the Inquest were doing their own research of the Sylvari (new race and all) or if it’s some sort of joint venture between the Inquest and the higher ups from the Arcane Council. These experiments are a likely reason for Caithe and Faolain to team up. This also gives us an idea of the time period which would be shorty (maybe a year or so) after the first Sylvari are born. On the last episode of Points Of Interest, there a was hinting of a twist at the end of this episode but it’s so hard to say what it could be, but I think it has to do with the Sylvari that Faolain is with. It could very well show us how Faolain and Caithe go their separate ways. Another thing that happen on POI was quite a bit of talk on Canach. He’s a character I feel to look out for this episode as well. To sum it up, there’s some sort of twist at the end and some truth will be revealed, and with the information we know now, it looks to be a good one! So there’s sadly not much for me to say on this Tangled Paths patch but hey, there’s always something. Skip this paragraph if you didn’t go through the episode. So on the side of story, there was very little but there was progress which is quite important. Caithe was being a little shady at the very start of the episode following us while we talking to people. In the end she stole Glint’s egg away from us after we found it. It makes me wonder if Mordremoth has an influence on Sylvari as it’s corruption spreads. Let’s think about it a bit. First it was Scarlet who got super close to Mordremoth and got “corrupted”. Then we have Aerin acting strange going after the Master of Peace. Now we have Caithe being all weird steal stuff from us. On the achievement front it’s quite similar to last patch where I felt enticed to do everything to get the luminescent armor piece. Also the reuse of the Silverwastes area was well done in addition to the use of the new area used in the story is also used in PvE. I was a bit worried for Silverwastes being dead after this patch but it seems we won’t be going to the left side of the Silverwastes just yet. Fairly moderate patch I guess, enough to keep us busy till the next one. Very interested story wise how it’ll go.